I’ve often heard this accusation, “The Catholic Church is full of man-made rules.” “Where in the Bible does it say that the Sabbath should be moved to Sunday, that we can’t eat meat on Fridays, that abortion is wrong, that two men can't get married (to each other), that I have to confess my sins to a priest, that we must go to Mass every Sunday, that a woman can't be a priest? Didn't the Catholic Church just make all of this stuff up? That's the problem with the Catholic Church: It's too concerned with man-made rules, and not with what Christ actually taught.” The surprising thing is that this is often expressed not by Catholic-bashing Protestants, but strangely (or perhaps, not so strangely) by Catholics themselves. The corollary to this is that if these are “man-made rules”, then there is no need to follow them. You can dispense with them as how Christ dispensed with the man-made rules and traditions of the Scribes and Pharisees in today’s gospel passage. Interesting argument but seriously flawed. Yes, it is correct to state that many of these rules are man-made, Christ made them and Christ was fully human. It was Christ Himself who instituted the Eucharist: “Do this in memory of Me”, He said at the Last Supper. “Go therefore and baptise”, He said, and it was He who included the Trinitarian baptismal formula in the rite. Our Lord was the master of creating traditions! But let us not forget this little, often ignored, seldom stressed point – Christ was also fully divine – He was fully God. So, no, though there are man-made rules in the Church just like any human organisation and society, and these rules can technically be changed and have changed over the centuries, there are fundamentally certain rules set in stone, on an unbreakable and indissoluble “stone”, precisely because God is the author, and man isn’t. Alright, given the fact that divine laws can’t be changed except by God, how about all the disciplines, canon law, rules and liturgical rubrics of the Church? Aren’t these man-made? Well, just because they are “man-made” doesn’t necessarily empty them of value. Traffic laws, statutory laws, municipal by-laws, school regulations, association rules would equally fall under the same category of being “man-made.” Can you imagine a society or a world that totally departs from any law or regulation and everyone is allowed to make decisions, behave, and act upon their own whims and fancies? If you’ve ever watched one of those apocalyptic movies of a dystopian world in the not too distant future, you will have your answer. We will soon descend into a society of anarchy, lawlessness, violence, where justice is merely an illusion and “might is right.” The reason for this is because none of us are as sinless as the Son of God or His Immaculately Conceived Mother. Laws are not meant to curtail and restrict our freedom. They are meant to ensure that our rights as well as the rights of others are protected so that true freedom may be enjoyed. In fact, man-made traditions, mark our daily lives. Every morning, it’s the same ritual for millions of people: have a shower, get dressed, pour a cup of coffee, eat breakfast, brush teeth, etc. Human life is marked by all sorts of “traditions”, whether it is setting up a Christmas tree, giving out red packets on Chinese New Year, having a cake and blowing out the candles, or celebrating with a meal. Ritualism, whether it’s pagan or religious, seems to mark the life of human activity in every culture, whether it is that of neighbourhood families, or that of the Church. Why? Because symbols are a language unto themselves; they carry a meaning that conveys something deeper, whether it is love, danger, memory, or mystery. That is why it is often surprising to hear both Catholics and non-Catholics condemn Catholic traditions, claiming these are merely “human traditions” that Christ Himself condemned. But did He? Well, frankly, He does seem to say so in today’s gospel passage as He condemned the practices of the Pharisees: “The worship they offer me is worthless, the doctrines they teach are only human regulations. You put aside the commandment of God to cling to human traditions.” For the detractors of the Church’s man-made traditions, it doesn’t get any clearer than this! But a more careful examination of Christ’s words indicate that He was not condemning human tradition, but those who place human traditions, laws, or demands before true worship of God and His will expressed in the commandments. The problem wasn’t “human traditions” but specifically “human traditions” that obscure the priority of worship and God. Man was made to worship God; it's in our very nature to do so. Every other human activity should either flow from this or should rank second to this. This is what liturgical rubrics hope to achieve. Detailed instructions for both the priest and the congregation are intended to ensure that God is ultimately worshipped and glorified in the liturgy, and not man who is to be entertained. In other words, all these “man-made” rules of the Church which, to some of us, doesn’t seem to be what Christ taught, actually flow from the heart of Christ's teaching. Christ gave us the Church to teach and to guide us; she does so, in part, by teaching us to know God, to love Him and serve Him and through all these, be united with Him in Paradise forever. But when we substitute our own will for this most basic aspect of our humanity, we don't simply fail to do what we ought; we take a step backward and obscure the image of God. Church rules are not just plucked out of thin air by “a bunch of celibate old men wearing dresses at the Vatican”, they are not just arbitrary as if these joyless old men wanted to kill spontaneity or make life miserable for the rest of us. And just because some of these celibate old men have been guilty of departing from those rules, does not absolve the rest of us from following those rules. These rules are given to us because the Church is our parent, she is both Mother and Teacher, guided, as Christ said she would be, by the Holy Spirit—not simply for her own good, but for ours. And so, like any mother, she tells us what to do. We may resent this as condescending. We may refuse to accept whatever reasoning the Church gives us. But at the end of the day, she guides us through these rules, disciplines and teachings because She truly cares and loves us and wishes us to arrive at the safe harbor of Paradise. It is often very convenient to denounce Catholic tradition as “man-made” or “human tradition” just because we don’t like it. The hypocrisy of such an accusation is often lost on those who supplant the Church’s tradition, rules and rubrics, with their own interpretation and version. The sexual abuse controversy raging in the Church is the result of choosing to depart from those rules, disciplines and teachings. By covering up the abuse, bishops and heads of seminaries have substituted worldly standards of non-judgmental tolerance for Christ’s “hard” teachings about sexual morality.This is the real truth. 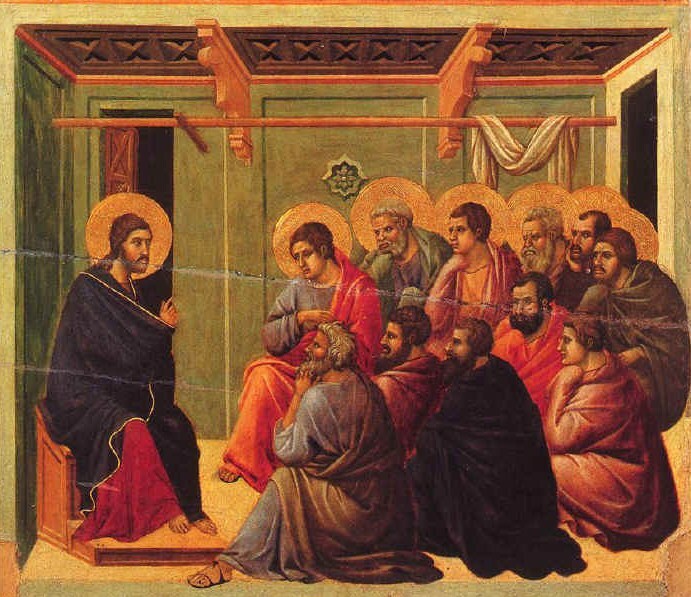 When we ignore or reject the rules of the Church, we are merely replacing them with our own “human traditions.” In fact, we are putting “aside the commandment of God to cling to human traditions.” It is not those who keep the rules but those who flagrantly break the rules that are the modern day Pharisees condemned by the Lord in today’s gospel. The Catechism of the Catholic Church tells us that Sacred Tradition, rather than a set of “man-made rules” or “human traditions” is “the living memorial of God’s Word.” Pope Emeritus Benedict XVI explains that Sacred Tradition “is not the transmission of things or words, an assortment of lifeless objects; (but) it is the living stream that links us to the origins, the living stream in which those origins are ever present.” Therefore, we should be putting aside our own arrogant personal thoughts and opinions, rather than God’s commandments, and come to acknowledge that it is not stupidity but humility to listen to the voice of the Church because as St Ambrose reminds us, “the Church shines not with her own light, but with the light of Christ. Her light is drawn from the Sun of Justice, so that she can exclaim: “It is no longer I who live, but Christ who lives in me’ (Gal 2:20).